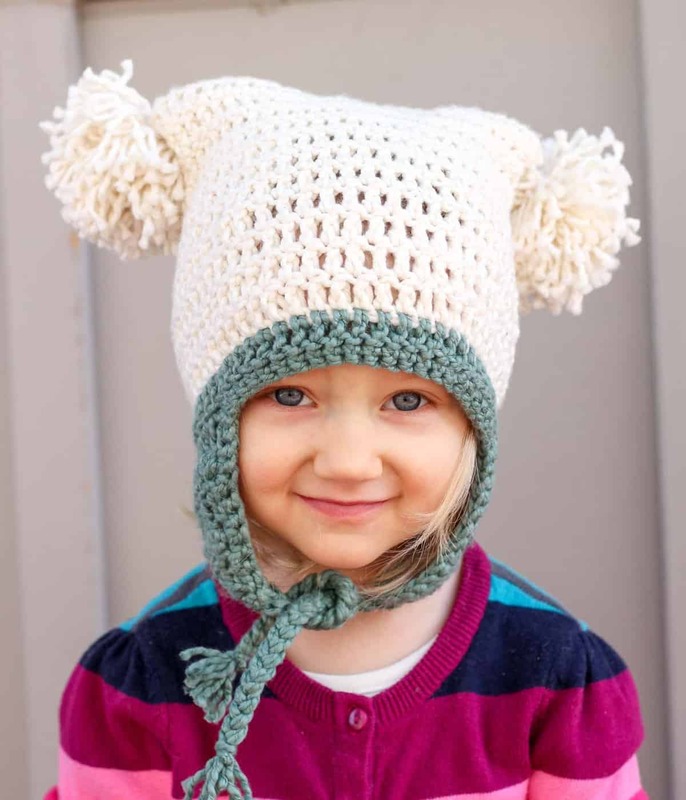 Free Beginner Crochet Beanie Hat Pattern "Pom Pom Party"
Have you been crocheting scarf after scarf, intimidated to dive any deeper into three dimensional patterns? I was the same way–for about 18 years! With all that practice crocheting in straight lines, I was one heckofa single crochet afghan machine as a teenager. While my projects weren’t super creative, I suppose there are worse things kids can be doing than plowing through those “one pound” skeins of yarn all summer. Eventually, I took the leap into non-flat crocheting and you can too. 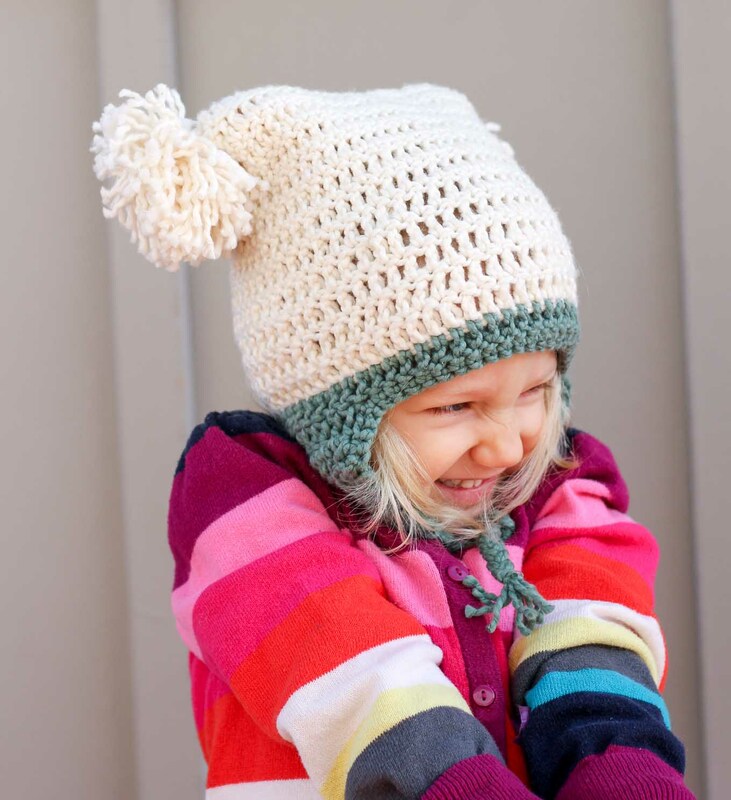 Especially with this pom pom hat pattern. 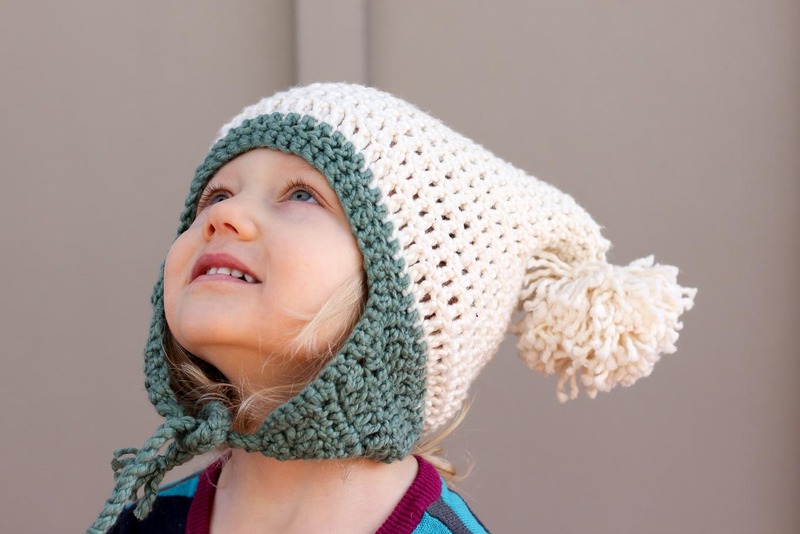 It’s a perfect beginner crochet hat pattern. Think of it like a little scarf wrapped around your head. The entire hat is crocheted in a circle with no increases or decreases and then sewed together at the top. It’s essentially a bag to wear on your head. 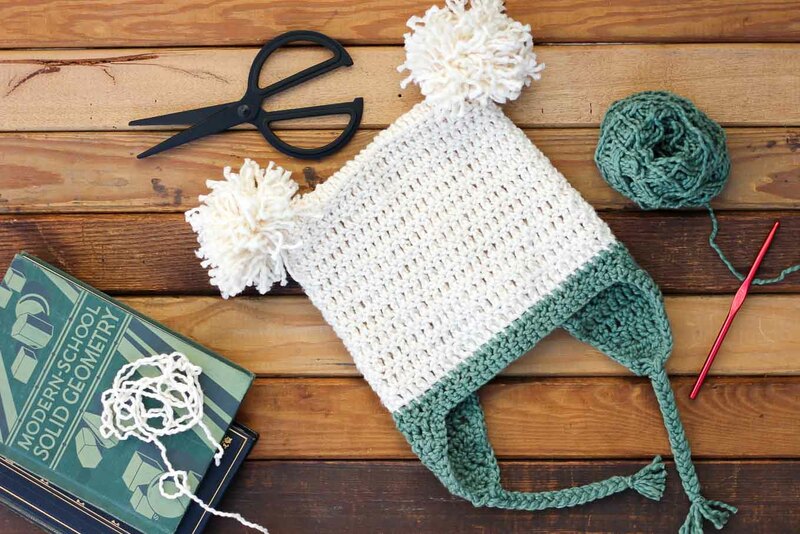 Don’t worry, the pom poms weigh down the corners of the beanie and add a playful touch. 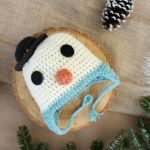 This easy hat pattern is really fast to crochet and therefore makes a great last minute DIY baby shower gift idea. 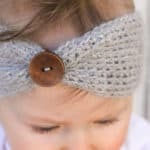 People LOVE crocheted baby hats. Especially moms-to-be. I think this one would be especially cute as a newborn photo prop for a winter baby. The yarn I used was in my stash and is discontinued. Boo. You could definitely substitute any worsted weight yarn though and you’ll be in good shape. I tend to prefer cotton yarn for these types of projects because I like the feel and look of it. I love to see your finished projects, ESPECIALLY if the project is your first spiffy crochet hat (yay you!) Tag me on Instagram (@MakeAndDoCrew) to show me your stitches. The instructions for the newborn size of this hat are included below. I’ve also written 3-6 months (baby), 6-12 months, toddler/preschooler, child and teen/adult sizes and those are waiting for you in the Make & Do Crew Subscriber Vault. 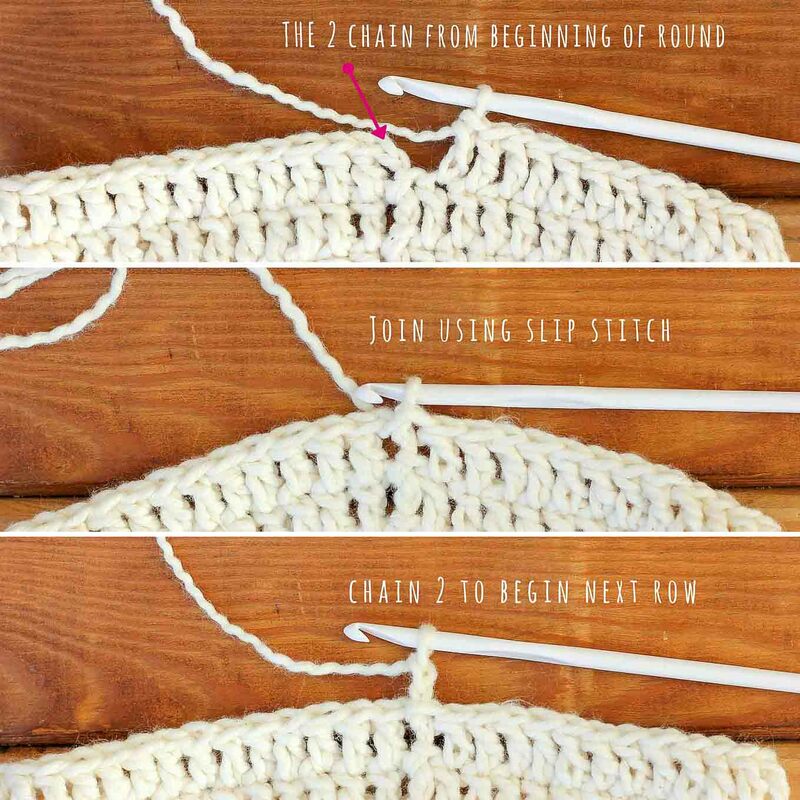 And in case you need it, here’s a quick reminder of how to crochet in the round and hide the seam. 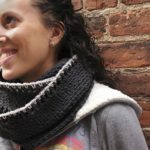 This technique is great for crocheting stripes too! First, you’ll insert your needle in the loop created by the 2 chain stitches that you started the round with. (Make sure not to crochet in the previous row’s slip stitch, which is the gap you see in the top photo to the right of the pink arrow. Skip that stitch!) 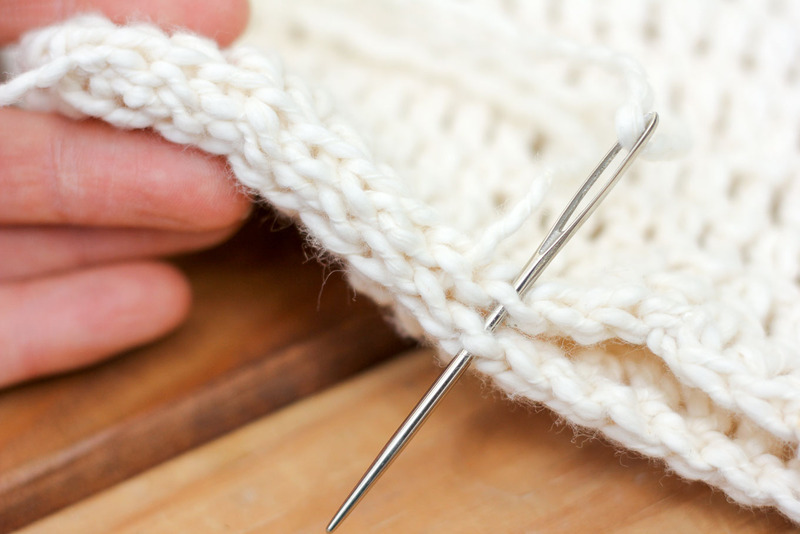 Do a slip stitch to join the row. Chain 2 to begin the next row. You may make items to sell with this pattern. In exchange, please link back to my homepage (MakeAndDoCrew.com) as well as this post page. Do not use my photos as your own sales photos. Do not distribute this pattern as your own. Now go make something awesome! This post contains a few affiliate links at no extra cost to you. Thanks for supporting the free pattern machine! Round 1: ch 40, join. Round 3-6: ch 2, dc around, join, fasten off and keep a long tail of yarn. 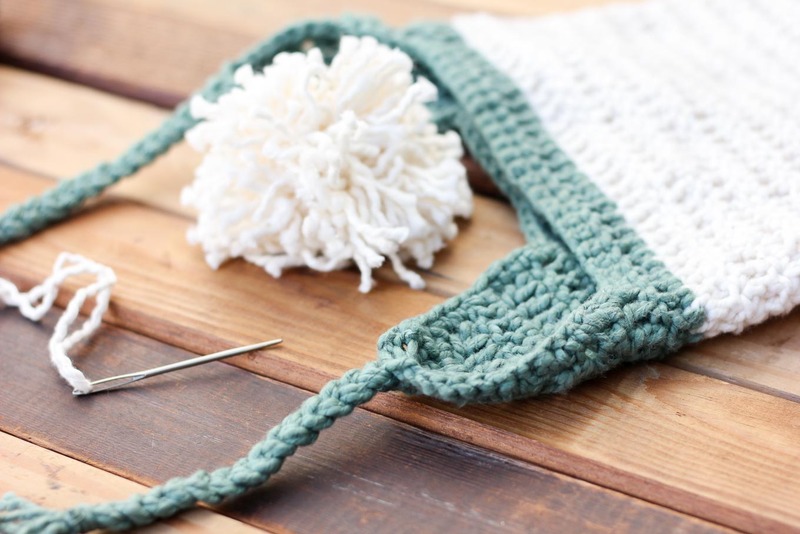 Using accent color, attach yarn to the bottom of the hat where you originally joined your initial chain. From hat seam, count 3 stitches in the other direction and attach yarn for the second earflap in the 4th stitch. Row 5: sc around entire bottom edge of hat including earflaps, join, fasten off. Turn the hat inside out. Using the tail you left at the top of the hat and a tapestry needle, sew the inner loops of the top row together. Fasten off. Turn hat right side out. Cut 12 pieces of yarn measuring about 16-20″ each depending on the size of your hat. Follow this chin strap tutorial to attach and braid them. 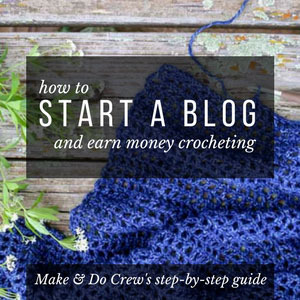 I love to pin free crochet patterns. Follow me on Pinterest for plenty of wooly inspiration! GET INSTANT ACCESS TO ADDITIONAL SIZES OF THIS PATTERN! Plus my entire library of free patterns and project templates. This is adorable!! Love the pom poms. Thanks Alexis! Everything is better with pom poms, isn’t it? I am a little sad to see Winter ending because I like making cozy patterns like this. What do you in the Spring and Summer? Keep cranking out your awesome cold-weather patterns or try to focus on things that are seasonal? Either way, I can’t wait to see what you make next! I still haven’t received the free pattern, now I’m having a go by guessing it ???? No sign of. Additional patern sizes even though I signed up’.? You should have received an email from me that explains how to download the additional sizes. Check your spam or junk if you don’t see it and let me know if you’re still having trouble! I’m so happy to hear you got it, Lori! You can access the bigger sizes of this pattern in the subscriber “vault.” Simply enter your email address in the box that’s on the upper right side of this website and you’ll get an email telling you how to accessing all the exclusive patterns and templates. If that’s what you’ve already done, search your email for something from “Make and Do Crew” because it might have gotten stuck in your spam/junk. If you’re still having trouble, please let me know. I’m happy to help! Once you’re in, the link to the pattern is directly underneath the photo of the project. Click on that link and it will open the pdf in a new window and you can right click it to download it or print it directly from there. I got the link in my email that says download pattern but it took me to the main page..? You can download the additional sizes in the subscriber vault. Just enter the password that was contained in the email and you’ll be able to access all the free patterns and templates that are just for subscribers. Let me know if that doesn’t make sense! I subscribed and went to the vault…I searched the vault and found the link to the additional sizes and it took me right back to THIS page that says to look in the vault for additional sizes. I’d love to make this for my granddaughter but I’m not sure how to make her size…not totally comfortable crocheting without absolute pattern instructions. Well, no matter what I try, it takes me right back to the newborn pattern so I guess I’ll just find another pattern I like as much. I’m sorry you’re having trouble. Are you clicking on the link right below the photo in the Vault? That link will open the additional sizes for you. The link below that that says “Tutorial here” will take you back to the original blog post. I clicked on the link and also the picture…it brings me right back here. I see links to the pom pom tutorial and the chin strap tutorial but none to the bigger sizes. Looks cute, quick and warm, just what i was looking for. Thank you so much for the beautiful free patterns..